Monday we celebrated Travis’ last birthday in his 20’s! I know, he’s getting old, right? 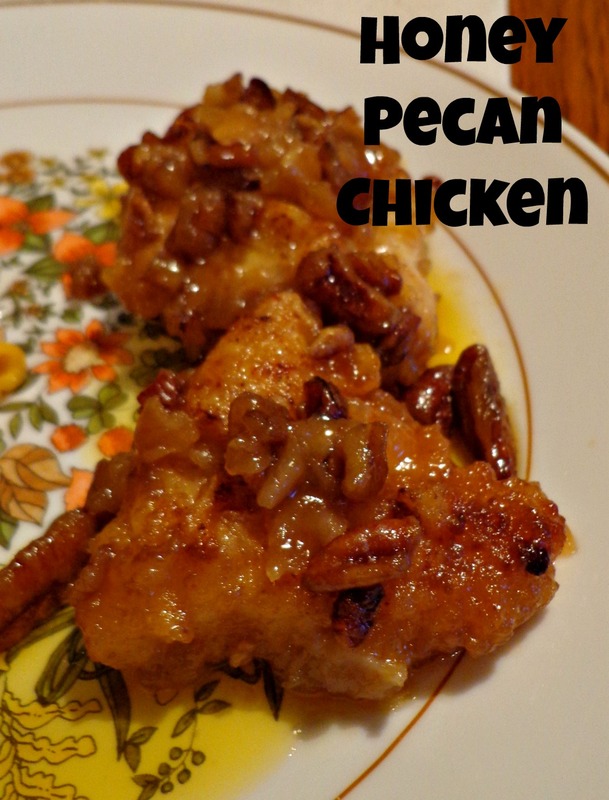 For his birthday dinner he requested Honey Pecan Chicken. We first tasted this sweet goodness a few months back when I was just a week away from having Summer and my parents brought us dinner. My mom had made this and we thought it was delicious. I figured it was hard to make, so I never even tried it! If you’ve been with me for a while you’ll know that a couple of years ago I said I was no longer going to let recipes intimidate me! So when Travis asked for this, I just called my mom for the recipe! Cut 2 or 3 boneless skinless chicken breasts into about 8-10 pieces. soak in 2 c. of milk and 1/2 tsp. vinegar for 1 1/2 hours. in a bowl, set aside. Take chicken out of milk and roll in flour. Let rest for 20 minutes. Heat pan with about a 1/2 inch of oil to brown each side of your chicken pieces. Place in greased oven safe dish. Then add 1/2 cup chopped pecans. Easy peasy and super delicious! Now go make this for dinner! « The Plus Party- Be there or be square!